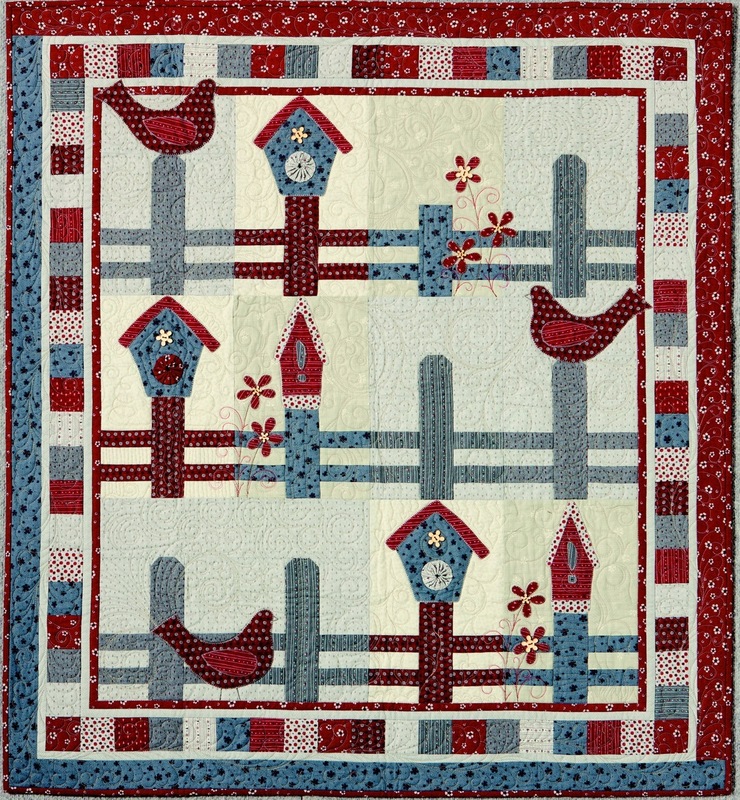 Over The Fence in AUSTRALIAN QUILTERS COMPANION (Issue 73) & Giveaway! Hello Friends, I hope you had a blessed Memorial Day weekend. Ours involved a bit of whirlwind traveling. We are home now, and are back to our normal schedule. I have been anticipating my copies of the latest Australian Quilters Companion to reach me from Australia… because I am being profiled in the issue – a small fish like myself! A huge thank you to the editor for the lovely feature! It felt sort of weird reading about myself in the profile — because in the core I am a private person and always do my best to not stick out. I don’t even like to look at my own pictures. 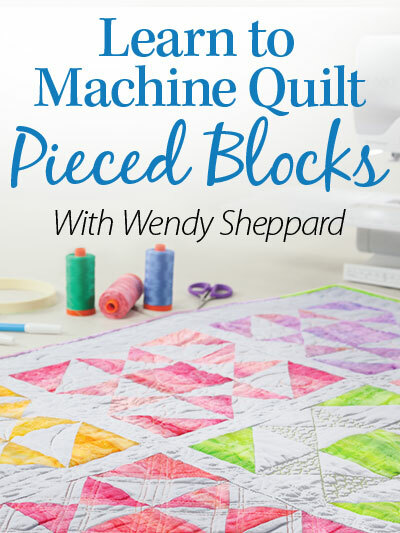 But at the same time, I also felt like the feature was an effective way for me to connect with my quilting friends. So I am torn… In this particular article, you will find out one of my “darkest” skeletons in the closet “sewing-wise”… keyword is zippers! Immediately after the profile in the magazine spread is a feature on my joint-venture project with Lynette Anderson, Over the Fence. The complete pattern instructions are included in the magazine. You may recall the fabrics used in this quilt, Lynette Anderson’s Hearts and Flowers fabrics by RJR Fabrics in my Making Valentines quilt. Lynette and I used the same fabrics in a different way for the pieced and applique Over the Fence quilt. The wooden buttons are exclusive to Lynette Anderson, and are available from her store. 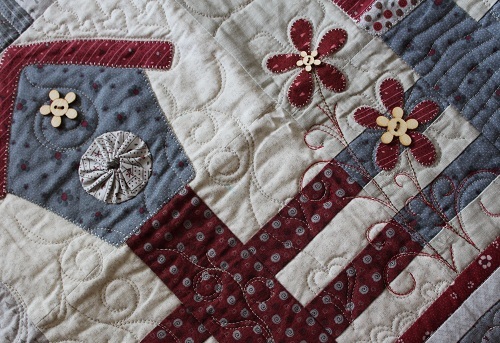 You may also give Sew Graceful Quilting a call and see if they might carry the buttons if you live in the US. I had so much fun quilting this quilt, and will let the pictures tell all! Please allow me to take this opportunity to welcome all the new followers — thank you for following. For those who are new, I quilt my quilts on a domestic sewing machine made by Bernina (a 640 to be exact). And I construct and quilt my quilts (exclusively) with Aurifil Mako 50 Cotton threads, and often over Hobbs Tuscany silk batting. Thank you for suffering through all the pictures, Dear Friends! I hope you have enjoyed Over The Fence. You may purchase or subscribe to the magazine in digital format by clicking here. Should you wish to preview the magazine in person, Australian Quilters Companion graciously sent me an extra copy to be given as a giveaway prize. Leave a comment here between now and June 3, 2015 to be entered in the giveaway. Winner will be announced on June 4. This giveaway is only open to US addresses. Thank you for stopping by! I wish you a lovely rest of the week, and shall catch up with you later! 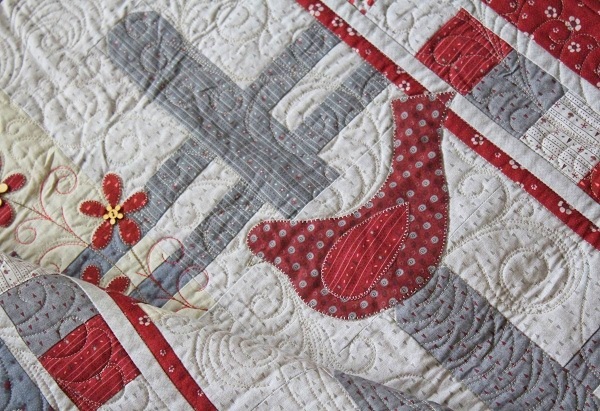 This entry was posted in Quilt Pattern, Quilting, Quilts & Projects: Published, Quilts: Pieced & Applique and tagged Australian Quilters Companion Issue 73, Bird Quilt, Lynette Anderson, RJR Fabrics Hearts and Flowers, Wendy Sheppard Designs. Bookmark the permalink. Just beautiful, I want one too!!! 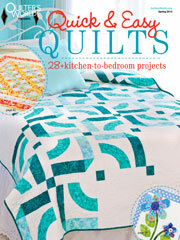 I love Quilters Companion! I get it thru Zinio but I would love to win a hard copy. Absolutely beautiful work… thank you for sharing so many lovely photos. What a generous opportunity to obtain the publication. You deserve all the accolades and its so nice to see you being recognized. Love the pattern and all the pictures. Thanks for sharing. Enjoy reading what all you have accomplished and see your beautiful work. You deserve to be profiled–enjoy it! 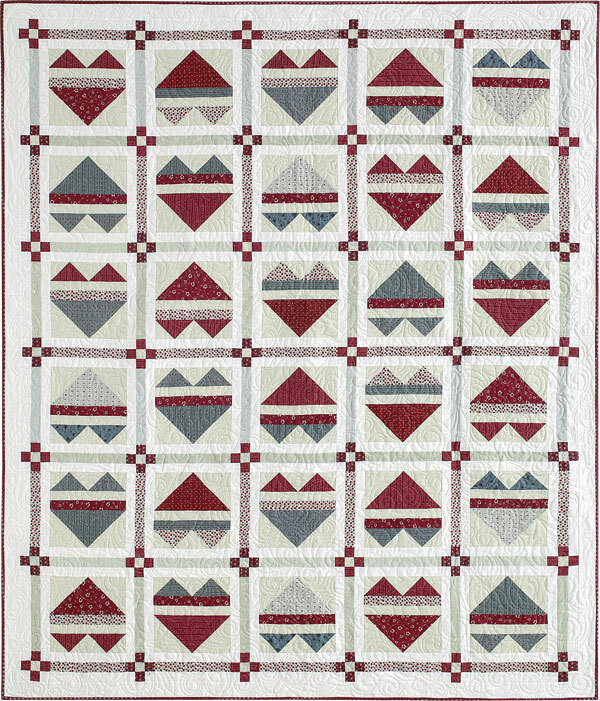 The quilt is adorable and your machine quilting adds so much charm–congratulations! Such a cute quilt! And congratulations on the well deserved feature. 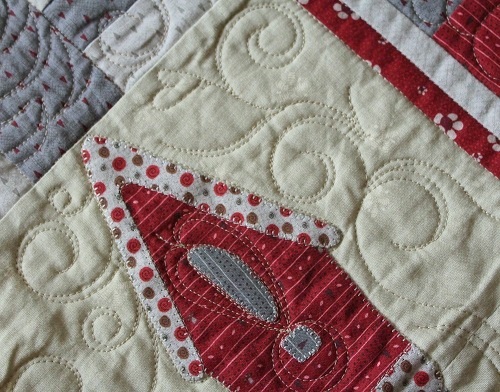 Wendy, your over the fence quilt is so sweet!! Loved all the photos and no suffering involved…LOL!!!! Would like to take a look at the Aussie magazine, too!!! Your quilt is delightful! 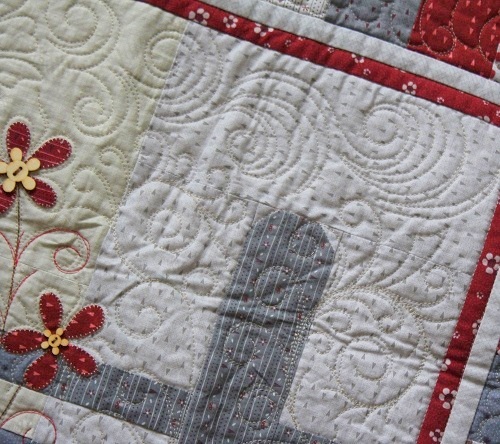 I’m always amazed at your sensational quilting! My daughter collects birdhouses and loves everything birds. She would love a quilt from this pattern. 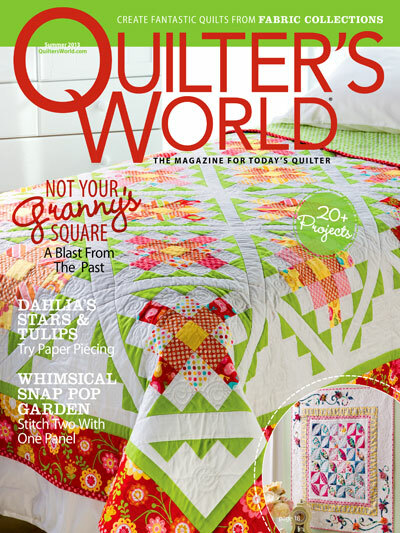 You deserve the feature article–spread the inspiration you give to more quilters! 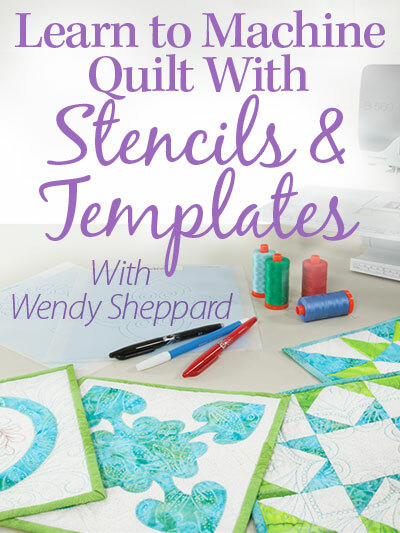 Wendy, you are a talented and hard-working quilter with a lovely personality. Of course you should be featured! Congratulations! 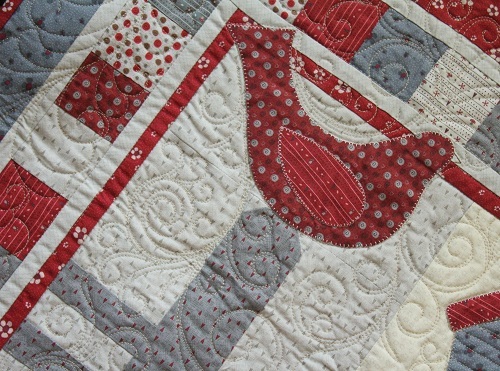 Love the Over the Fence quilt too! Thanks for sharing the photos! Wow! Just beautiful! 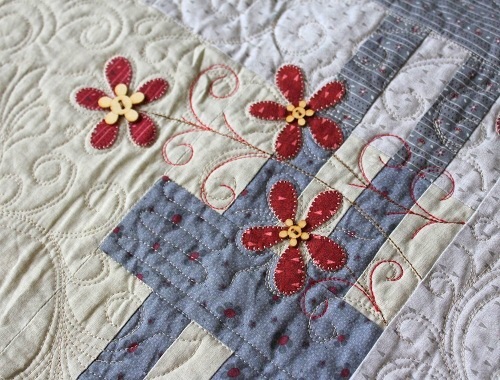 I am inspired by the projects you take on and how the quilting makes the piece work pop. Congratulations on the article and projects. I really like Over the Fence and will get the digital magazine, but I’d love to have that hard copy! Thanksk for all the up close pictures! Lovely pattern – would love to win to gift the magazine on to my Mother who gave up her subscription (senior cutbacks). I enjoy your blog. Thanks for giveaway! Beautiful! 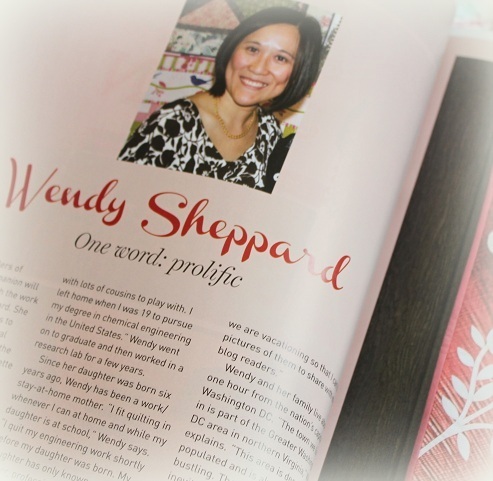 Would love to win a copy of the mag, read the story about you and get the pattern! Thank you for offering this giveaway! So darn cute!! A very special quilt. Thanks for sharing. 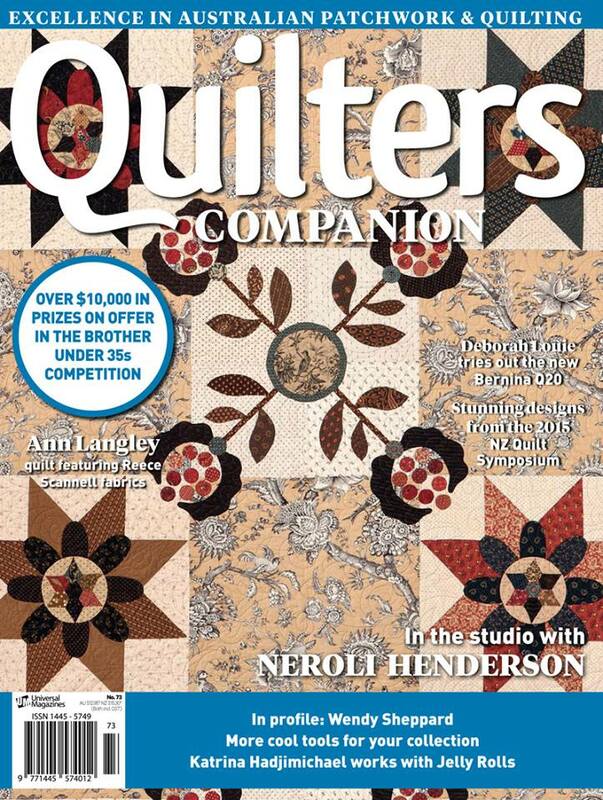 Being a digital subscriber to the “Australian Quilters Companion” I very much enjoyed reading the profile of one of my very favorite quilters. It was very complimentary of you, Wendy. You deserved all the kind words. “Over the Fence” is fabulous. This one may need to sneak to the top of my list of “to do” projects. My husband is a bird fancier, he would be thrilled to have this one. Many thanks to you and Lynette for the inspiration, and the pattern. PS. A hard copy would be the icing on the cake, thanks for a chance to win. What a lovely quilt! I’d like to make one for myself. 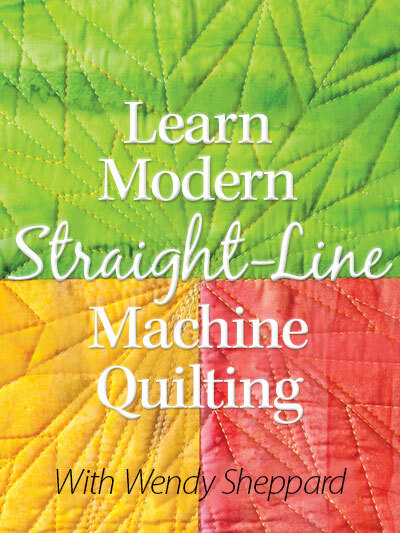 Congratulations on your feature in Australian Quilter’s Companion! 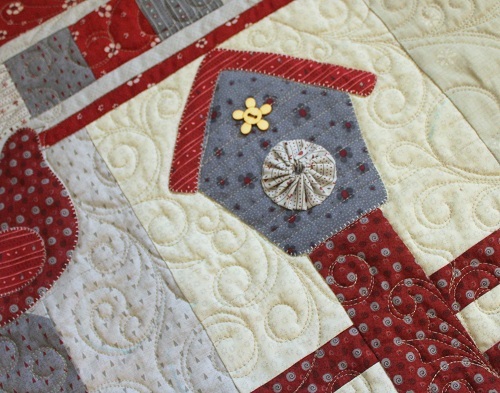 Love the quilting on “Over the Fence.” Thank you for the chance to win the magazine. I’d love to have a copy of this magazine. They are hard to find in the US. Your work is beautiful. How fun to travel to Australia. Both quilts are lovely. I’m not only a fan of yours, but Lynette’s too! You sure are prolific! I am amazed at the wonderful quilting you do on a domestic machine! I can barely manage to quilt-in-the-ditch! Congratulations! I’d love to win this! Wendy, I am in awe of your quilting on a domestic machine. I have a 640 also and you are an inspiration. Thanks for posting all those lovely photos. 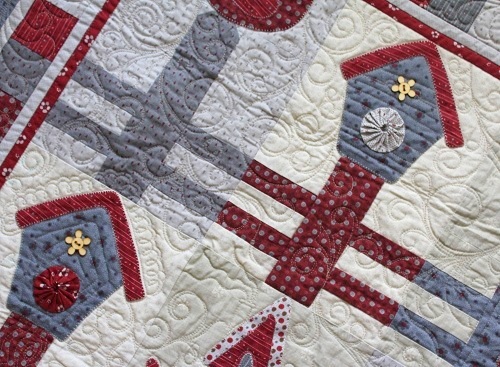 Love everything about that quilt! Would love to be the lucky receipent of the magazine so I’d have my own pattern! Love your blog! feature an article about you. Would love to have the issue. That is indeed a very happy quilt. Brought a smile to my face. 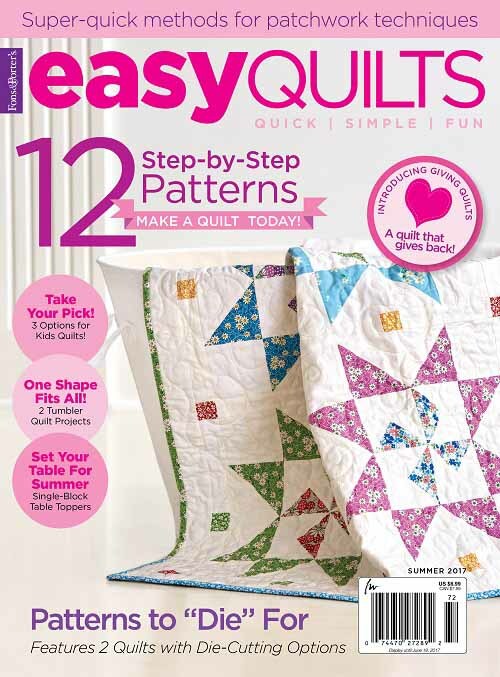 I would love to win the magazine and your Over the Fence quilt is so darn cute. Congratulations on the magazine feature! That is a very cute quilt. Your work is always so lovely to look at…thanks for sharing! I am intrigued by this magazine and would love to see a copy! Thanks for sharing your lovely work as well. I like the bird houses. Thanks for a chance to enter. Congrats on the magazine feature. Wendy, you quilting on Over The Fence is exquisite. Love the tail feathers of the birds. 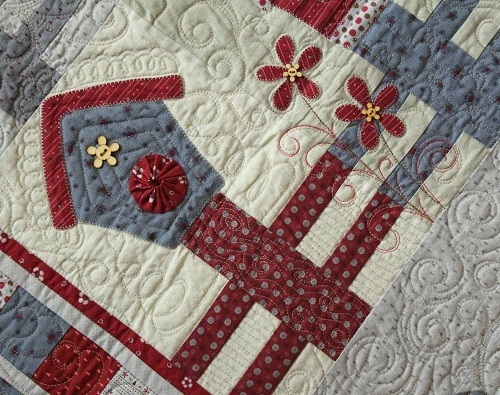 I love the quilt..the red and. grey are lovely together. 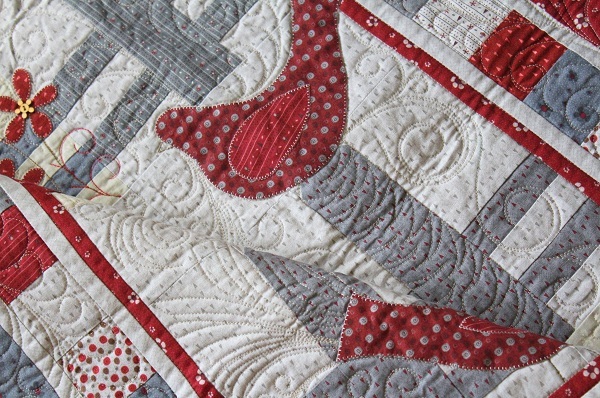 I am in awe of the quilting, especially because you did it on your home machine! This is wonderful Wendy! Love this quilt and the way they photographed it. Congratulations Wendy! Congratulations on your magazine post. Prolific is the perfect word but they forgot talented. Love your patterns and thanks for the chance. Congrats Wendy. You deserve it for sure by what I just observed from your pictures. I just love your quilting! You are so, so creative. 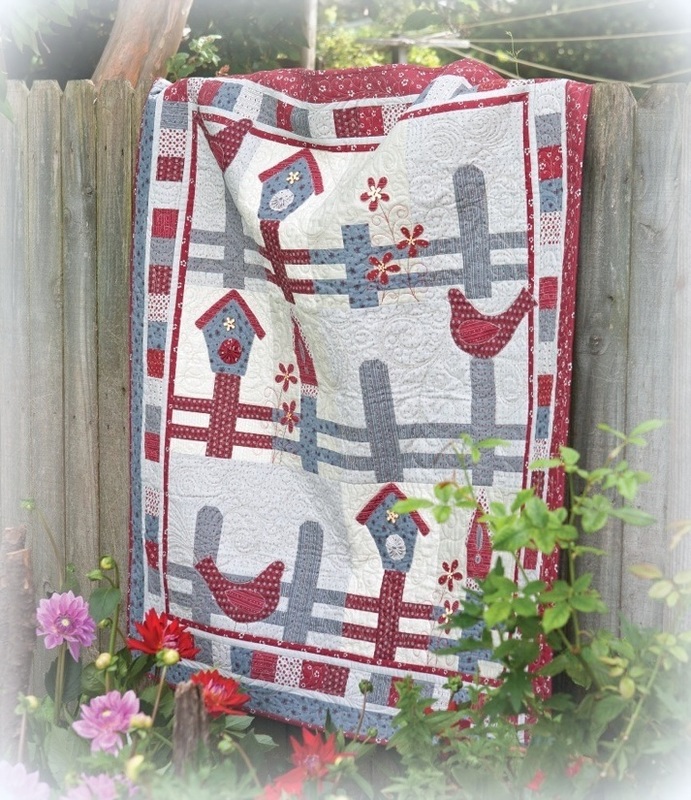 What a pretty quilt, i just love the birds. They are perfect for summer. So proud of you and your accomplishments. Thank you for all the close up pictures of your beautiful quilt. This one is so cute Wendy. Congrats on the feature. Reblogged this on Quilters Companion. 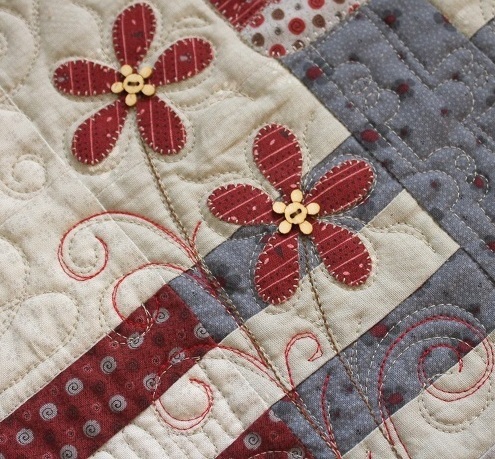 This quilt is so pretty and the quilting is amazing! 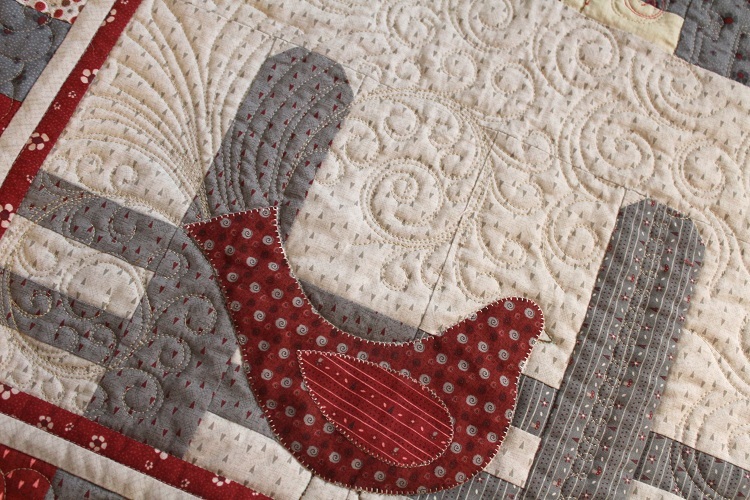 I’m taking notes about the echo quilting around the flower and the quilting design at the bird’s tail. I love your ideas!!!! 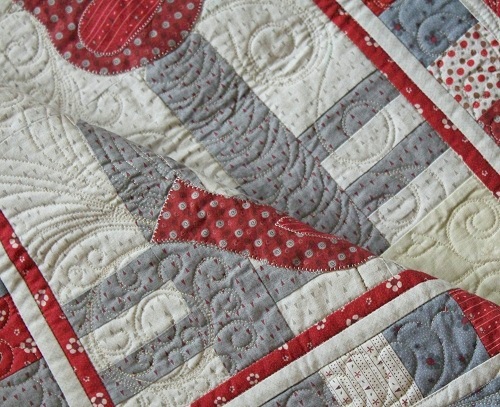 Love your quilt and quilting. Beautiful work.